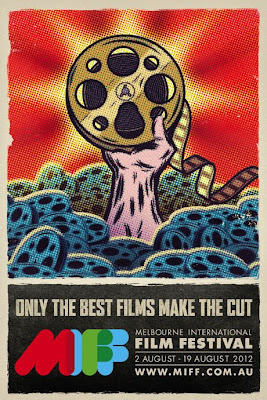 We interrupt the usual food-related content on this blog for a quick post about another obsession of mine: the Melbourne International Film Festival! Happy MIFFmas, everyone!! If you're not a MIFF member already smugly clutching an advance copy of this year's program to your bosom, there's a copy in tomorrow's Age (Friday 13th). I look forward to setting aside several hours over the weekend to curl up with my copy and go through it with a fine-tooth comb, narrowing down the list of films I want to see and coming up with a workable schedule (extra degree of difficulty for me this year as I'll be away in Hong Kong (!!!) for the first week of the festival). Because I like to maximise my chances of catching films that can ONLY be seen at the festival, I tend to exclude from my shortlist films that I know already have an Australian cinematic release date. I do this by checking the film release date schedules on websites like AtTheCinema and atonalFILM, and cross-referencing them with the MIFF 2012 program. This year, I thought it may be helpful for other similarly-minded MIFF nerds if I presented my findings on the web. These lists are correct to the best of my knowledge based on what I've found online (EDIT: I've now also included films that have distributors but don't yet have release dates, thanks to the excellent list on Mel's blog A Wild Young Under-Whimsy). If you know of any additional films that should be on the list, dates/distributors that have changed or any other relevant information, please let me know! Updated as at 24/7/12. So, film nerds: what films at MIFF this year do we HAVE to see? I can strongly recommend using this extremely useful FestivalSessions festival online planner - it's brilliant! And for the foodies still reading: any dining tips for me for Hong Kong?? Seeking a Friend for the End of the World I would assume has an Australian release date. Seeking a friend for the end of the world is in the program and I can only assume it would have an Australian release date. It's vaguely touristy, but still one of the best and most reliable places in HK to get an egg tart with cookie crust - Tai Cheong bakery. If you love seafood, then you MUST get out to Lamma Island for a seafood banquet. Dirt cheap yet glorious! And only costs $1 on the ferry to get there. No excuses. I love Ming Court at Langham Place Mongkok. The most delicate dumplings I have ever had. They have 2 michelin stars as well. The coconut custard tarts near the flower markets at The Supreme Cakes 176 Prince Edward Rd. West, Kowloon. are amazing. Lastly the truffle dumplings at Din Tai Fung in the Silvercord Shopping centre 30 Canton Road, Hong Kong were great. Love the MIFF research - as for Hong Kong lots of tips on my blog - I was there in December (I won't put a link as that is a bit cheeky!) I would particularly recommend Tim Ho Wan, Under the Bridge Spicy Crab & Maxim's City Hall. Also the street food. Check out e-ting's blog for her great Hong Kong guide - she has lots of tips. holy motors and vulgaria will screen at nova after the festival (http://www.cinemanova.com.au/filmsoon.html). Three places to recommend in HK: 1) Save up to eat at the Michelin stared Lung King Heen at the Four Seasons Hotel. I've been there for lunch and dinner. Both exceptional. Lunch/Yum Cha gets you a great view of the harbour too. Order some champagne and get the Maitre d' to order for you. The best you will ever have. Otherwise there are so many places to go to - just get stuck in (don't go to that Goose restrauant - its a tourist trap). hope it's not too late for hk tips, there's good food in tin hau, an area east of Victoria Park. My cousin recommended a beef brisket noodle shop place near the train station (there are cartoons of an auntie type; it's on a triangle corner. i think there is also a rival noodle shop close by so you can judge for yourself! also in tin hau, there's an awesome dessert cafe called ching ching - truly my idea of heaven!